Another major storm in the Atlantic expected to develop hurricane force winds. 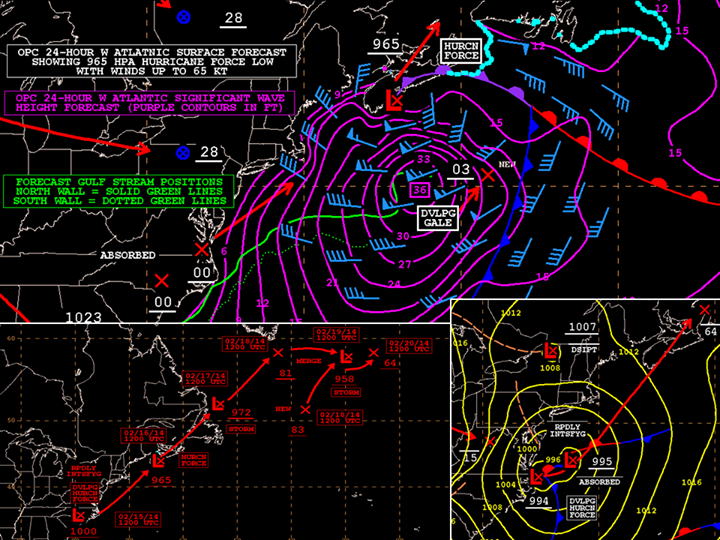 Another major winter storm brewing in the North Atlantic. This is the latest snowstorm to blanket New England in a foot of snow. Picking up speed and moving east to Europe and possibly Great Britain. "Rapidly intensifying low pressure off the mid-Atlantic coast is expected to develop hurricane force winds within the next 24 hours in the W Atlantic. The top portion of the image contains segments of the OPC 24-Hour W Atlantic Surface and Wind/Wave forecasts produced earlier today. A composite forecast of the low track through 120 hours from today's 12Z OPC charts is in the lower left, and a part of the 18Z Atlantic Surface Analysis is in the lower right.